Conventional practice for establishing the integrity of process plant is to inspect during shutdown. Financial pressures to keep plant on-line limits the extent to which this is possible, as a result it is important to make best use of maintenance resources to minimize down-time, whilst still avoiding costly in-service failures. The ability to identify developing problems on-line helps direct in-spection effort quickly to the problem areas during shutdown, this increases efficiency and minimizes shutdown time. Almost more important, the identification of areas that do NOT require inspection avoids the waste of resources inspecting areas that are not suffering from any in-service deterioration. With lost production costs running at between US$0.1-1m per day, the cor-rect planning and management of shut-downs should involve ad-vance planning and in-service testing to take as much testing and inspection work as possible out of the shut-down period. There are many methods that may be applied in-service, a brief but not exhaustive list is given in the following section, together with key benefits and limitations. 2.1	Ultrasonic Corrosion Mapping is able to provide quantitative information on corrosion of vessel plate and welds, and even the condition of certain internal coatings, it is an invaluable and widely used tool. The limitations of the method are the maximum temperature at which inspection may be carried out, due to the need for an acoustic couplant that can slide with the inspection probe, and the high cost of inspecting large areas such as complete vessels. The latter is reducing with the introduction of advanced scanners such as the NDTA LSI (Large Structure Inspection System), which can corrosion map both surfaces simultaneously at up to one square metre per minute, provided the surface is clear of insulation and obstructions. 2.2	Ultrasonic Weld Inspection, either shear wave and/or TOFD are the methods of choice for detecting weld cracking, again there are access and temperature limitations, and also the issue of manufacturing defects, which may have always been present, and pose no threat to integrity. Finding these can raise more questions than answers. 2.3	Long-range Ultrasonics, for otherwise inaccessible areas, can give useful indications, but tends to be poor at quantification so must be used with care. 2.3	ACFM is a very useful method for detecting external surface weld cracking through the paint, again it is a localised scanning method but can scan welds quite quickly, temperature and access to the surface are the main limitations here. 2.4	Guided Wave Ultrasonics is an excellent rapid screening tool for insulated pipe-work, and helps direct local inspection such as UT corrosion mapping and follow-up visual inspection. Limitations are temperature of 70-120 deg.C, and sensitivity limited to ~5-10% loss of pipe cross-sectional area. 2.5	Acoustic Emission (AE, ref. ), is complementary to normal NDT methods, but is able to test/monitor 100% of a structure us-ing relatively few stationary sensors, which may be installed through small holes in the insulation. In addition it is primarily sensitive to active defects, ignoring inactive manufacturing de-fects, and it is often possible to use the method whilst plant is on-line, maximising production time. Unlike most methods, there is no probe temperature limitation with AE, as sensors may be cou-pled through metal acoustic waveguides welded to the plant, the sensor being outside the insulation. The above is not an exhaustive list, and there is no "ideal" test method, a combination must always be used. 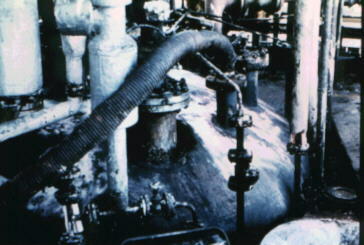 In addition, other items of plant will have specific test and monitoring methods, for example valves may be checked for leakage rate by using the VPAC portable or on-line system, or more sophisticated on-line monitoring such as Valve-guard, which periodically checked op-eration and leakage. AE is often used as the "front-line global method" and used to di-rect follow-up local NDT, with high temperature plant AE may be the only on-line method that can be used. Sensitive to propagating defect activity and damage to micro-structure (cracking, corrosion, overstress). Not affected by defect orientation. Identifies when damage occurs (monitoring use). Good to direct local NDT. Relatively straightforward to apply to high temperature equip-ment. Does not measure physical defect size, which requires follow-up NDT. Does not detect manufacturing defects, unless they are propa-gating in-service. Not possible to apply on-line to all plant. It is clear that AE and NDT methods are complementary since NDT methods are applied locally, indicate static presence of de-fects rather than dynamic growth, and give sizing information. The ways in which AE may be used are often misunderstood, the section below briefly describes some of these. This involves increasing the stress on the item under test whilst monitoring for AE from any active defects. This usually requires the ability to increase the stress (i.e. pressure or level) to typically 10% above the maximum stress that has occurred during the past 12 months operation. The main limitation of this approach is the requirement to change the pressure, which is not always possible. The test may be carried out on-line or during a temporary process pause, depending upon circumstances. Damage to plant may be the result of unpredictable process tem-perature or pressure transients, in this case continuous AE moni-toring may be the only way to identify propagating damage and the conditions under which it occurs. This approach is also used for alarm monitoring systems such as those used on methanol converters, instantaneous response is required in this case, so the AE system will shut down the plant in the event of a major process or structural problem. Certain types of plant experience conditions of highest stress dur-ing specific conditions, such as during start-up or shut-down, or during thermal cycling. In this case AE "semi-continuous" monitoring should be applied during these periods to identify any defect growth. Deliberate increase in stressing, for example by increasing cooling rates, is not recommended, as this may actually cause defects. Active corrosion may be detected by monitoring for a short period of time, this approach is used for storage tank floors, and, by us-ing higher frequency sensors to minimize process noise, on proc-ess plant, particularly stainless steel. In some circumstances this may be applied on-line, so that corrosive conditions are identified before significant damage is done to the plant, and process changes may be made. Not AE by the strict definition, but AE sensors are used to detect leakage in pressure systems and valves, to monitor burners and other continuous processes, and monitor sand particles in oil pro-duction. i) Pressure storage vessels such as spheres and bullets; these are tested using method "A" above, also tested using this approach is the wall and knuckle area of storage tanks, the stress in this case is increased by raising the level. According to the International Process Safety working Group, (IPSG, ref. ) the most commonly used procedure for this test is the MONPAC™ procedure (ref. ). This also formed the basis for ASME VIII article 12 as applied to new vessels. In addition to the AE test and any required follow-up NDT, complementary NDT should be applied to check for early corrosion damage; a "C-Scan" strip covering all conditions seen, plus IRT or similar method to check for corrosion underneath the leg fire protection, which has led to collapse in the past. ii) Thick-walled high temperature plant, such as methanol converters, platformers, and ammonia converters, use method "B" or "C", the choice depending upon process conditions (ref. ). Due to the very high temperatures there is not much in the way of complementary NDT that can be applied on-stream, with the exception of thermography, to identify insulation problems. However, the on-stream monitoring allows NDT to be directed to any problem areas immediately the plant is shut-down, helping shut-down planning and minimising down time. iii)	 Most storage tank floors are tested in-service using method "D". The TANKPAC™ procedure accounts for virtually all testing (ref. ), and was developed together with an oil industry working group. It has been applied to more than 5000 tanks as a primary maintenance planning tool, and its reliability widely reported (refs. [6,7]). This method addresses general floor corrosion, corrosion of the shell is easily addressed in-service by ultrasonic C-scan magnetic crawlers, and specialist methods such as TALRUT provide limited information on the critical shell-to-annular area by UT scanning from the chime, provided this is in good condition. iv) On-stream process plant may use a similar method to identify active corrosion and stress corrosion cracking (SCC), provided the noise levels are not excessive. Developed by a consortium with EC support, primarily to detect corrosion pitting and stress-corrosion cracking in stainless steel process equipment, the CORPAC™ procedure (ref. ) uses higher frequency sensors to reduce the effect of process noise. 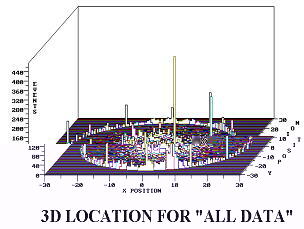 The use of higher frequency sensors limits the detection distance to the local area (~+-1m). Examples from each type of test are presented, naturally, for interest, these are cases where defects have been identified and confirmed; however, the majority of tests will not indicate significant problems, allowing valuable inspection resources to be focused elsewhere. This set of five vessels could suffer stress corrosion cracking if any moisture got into the process. The internal steam heating coils were a possible source of moisture should they leak, and the cost of shut-down was in excess of £100,000 per day, added to this, the contents were toxic. The vessels were tested annually using the MONPAC™ procedure, 64 sensors provided 100% coverage of the five vessels, and the test was conducted by increasing the pressure using the plant nitrogen supply, from the operating pressure of 8 psi, to 9 psi, in stages, over a period of ~ 1 hour. Design pressure of the vessels was 50psi. The test was always carried out ~16 weeks before shut-down was scheduled, this provided sufficient time to have new top-heads manufactured should a problem be identified by the on-line test. The results of the in-service test usually indicated no identifiable defects, with all sensors graded "insignificant" on the MONPAC™ severity scale, on two occasions however the the in-service test identified "E" grades (the most severe) on a top head. On both occasions the appropriate top-head was manufactured ready for replacement at shut-down. Subsequent inspection and sectioning on both occasions confirmed stress-corrosion cracking up to 80% through wall, the advanced warning saved >£2m in lost production. Even had five replacement heads been carried it would have been 2-weeks into the outage before all five reactors could have been decontaminated and fully inspected. On a third occasion "C" sources were identified, this time NDT was unable to confirm these at the subsequent outage, and the plant was returned to service, nine months later "E" sources were present in the same locations, and near through-wall SCC confirmed at the subsequent outage. Platformers comprise three carbon steel vessels stacked on top of one another, plus a lot of stainless internals. During start-up and shut-down the thermal stresses are high where the vessels are joined together. Cracks have been found on platformers where the top heads join the shell, so this critical area is an ideal candidate for monitoring during operation to investigate the cause. The temperature of the vessels is up to 550 deg.C so "wave-guides" (welded to the shell through the insulation) are used to allow on-stream monitoring, sensors are then outside the insulation on the end of the guide. During one planned shutdown intense AE sources were identified on two lower top-head-to-shell welds, one extending one third of the way around the circumference, the other two-thirds of the way around. NDT confirmed cracking around both heads at these locations. It was not known if the cracking was pre-existing, extending during the shut-down, or caused by the shutdown process itself. The plant would regularly "trip" during operation, and concern was expressed that this may be leading to crack growth. Following repair the decision was taken to permanently monitor the vessels. The following year of operation provided may plant trips, but no evidence of cracking during these. The next shutdown however provided more evidence of cracking. Analysis of the difference between plant trips and shutdown showed that during a plant trip the compressor would stop, leaving the hot gases inside the vessels. Shutdown however left the compressors running circulating cooler gas, the internals shrouded the shell keeping the shell hot, but the gas cooled the heads quickly, resulting in them "shrinking" away from the shell, resulting in the cracking. A much slower and better controlled cool-down prevents this, and saves $m's in lost production which would otherwise result from the need for repairs. It is no longer considered necessary to enter the vessels for inspection during shutdowns. 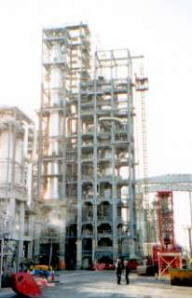 One design of methanol converter has internal refractory and a burner providing internal temperatures of 1300 deg.C at a pres-sure of 40 bar with hydrogen. Should the refractory fail, overstress of the transition region could occur within 30 seconds, and within two minutes could burn through the 100mm shell releasing 200 bar hydrogen. Clearly any "safety" monitoring system must give instantaneous warning and provide this information direct to the plant DCS, enabling rapid shutdown. Although thermal methods are used to identify any long-term refractory problems, the slow heat transfer means that if a rapid refractory failure occurs the shell has almost burned through before the alarm is given, making shutdown before blow-out impossible. Acoustic monitoring of the burner and shell gives instantaneous warning, the monitoring system provides 48 status and alarm signals direct to the plant distributed control system (DCS), plus an interface giving source position information. Operating experience over five years gave no false alarms or down-time, and showed continued effectiveness under simulated alarm conditions. This is one of the largest application areas for in-service testing using AE, special sensors are mounted on the shell above the bottom knuckle, and these detect the sound of corrosion product formation and break-up from the floor. Disbelief is the usual response to this procedure, however an industry user group working with Physical Acoustics Limited developed and proved the method in the field over a 6-year period and more than 600 in-field tests. The results of comparison between the TANKPAC™ test result and subsequent internal inspection and repairs were reported by the user group chairman at the European NDT Conference (ref. ). One of the statistics from this showed that up to 50% of tanks were removed from service unnecessarily, wasting considerable maintenance resources and cleaning costs. A look at the statistics more carefully however, showed that some sites had over-maintained their tanks, whereas others had neglected them to the point where the majority was in need of urgent maintenance, such as the "E" grade tank (below) which had lost more than 50% of the annular ring thickness and was immediately retired from service. A similar tank subsequently collapsed when the annular failed during filling, resulting in rapid loss of contents and pulling a vacuum. Savings of $25m per annum were reported by one company using the system for maintenance planning. Figure 1. TANKPAC™ 3D view of tank corrosion damage. A new long range ultrasonic method called TALRUT allows some indication of annular damage to be obtained by UT from the chine, it is not particularly sensitive, but will identify severe pitting close to the shell and up to ~30cm in from the chine. Testing speed may be up to 40m per day, but requires chime to be ~50mm wide with a top surface in reasonable condition. Figure 2. TALRUT C-Scan image of annular ring (taken from chine) showing indications of severe corrosion pitting. In-service detection of corrosion and stress-corrosion cracking using CORPAC™ technology is ideally illustrated by this example on an operating distillation column. It was impractical to change the stress during operation, and due to flow noise the use of any other standard AE procedure was not possible. The column was operating at 150 deg.C and the result of the di-agnostic, which only required passive listening for a period of one hour, indicated localised active corrosion. Subsequent inspection during shutdown found stress-corrosion cracking in that location. Many tests on columns are carried out during a temporary process stop, or at the start of a shutdown, using pneumatic pressurization with AE monitoring, this is particularly effective for identifying existing stress-corrosion cracking. One instance of testing an insulated acetic acid column identified SCC (external chloride induced) which was subsequently confirmed by dye penetrant inspection, which went through the wall, the test was three months ahead of a planned outage and it took six weeks to complete a temporary repair. 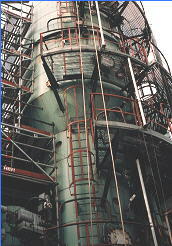 During the outage the column was stripped, chemically cleaned and treated externally, and a new in-sulation system installed. Two years later an AE test indicated significant problems in the bottom head area, this was confirmed as internal damage, the weld heat affected zone having dissolved to 50% wall thickness, requiring sixteen shifts of welding to repair. The cause had been a slight change in the process to save fuel costs, which moved the corrosion balance sufficiently to cause the problem. In-service corrosion of this pipe manifested itself as severe selective corrosion of the weld and heat effected zone, the decision whether the platform could be kept in production, and what repairs would be needed, required accurate, quantitative, information on the extent of the damage. Advanced LSI mapping of welds produces not only c-scan images, but detailed statistical and analytical information that may be used in a fitness for service analysis. The small section illustrated shows local selective corrosion of the weld HAZ from the original 20mm down to less than 5mm remaining wall, around a large part of the circumference, in isolated areas the weld has also corroded away. The ability to get accurate quantified thickness data, even across welds, is dependent upon not only the system used, but the probe and operator. In this example the time required to scan the weld on an 18" pipe is less than 10 minutes. The authors hope this paper has given a flavour of some approaches that may be used to improve the up-time of continuous process plant, whilst simultaneously improving the utilization of inspection and maintenance personnel during outage by "targeting" their activities. There are so many application examples that we can only scratch the surface in the time available, the technology in use today continuously monitors offshore platforms, reactors, exchangers, valves, rotating equipment and pipelines. Modern instrumentation is efficient, intrinsically safe, and communications connectivity makes plant the other side of the world easily accessible at low cost. It should be remembered that the test and monitoring technologies described here are often used because RBI evaluation has identified the need to inspect for particular damage mechanisms in order to reduce risk of in-service failure. Shown below is a view of where the AE, NDT, and fracture mechanics/fitness for service fit together in an RBI in-service integrity program, avoiding unnecessary inspection and repair. The authors would like to acknowledge and thank all members of the UK and Netherlands based user groups who helped to develop the advanced field applications of AE for in-service plant, EPA Paris and its partners for the CORPAC™ development, and PAC engineering for continuing to develop leading edge solutions to inspection and monitoring problems. British Standard, 2000. Non-destructive testing Terminology Part 9 : Terms used in acoustic emission testing, BS EN 1330-9:2000. Hewerdine, S., Plant Integrity Assessment by Acoustic Emis-sion Testing, Institution of Chemical Engineers International Process safety Working Group, ISBN 0 85295 316 X.
Fowler, T.J., Chemical Industry Applications of Acoustic Emis-sion. (1992) - Chemical Engineering Progress. Gautrey, S.N., Cole, P.T., (1997) Proceedings of 22nd Euro-pean Working Group Conference on Acoustic Emission. Aber-deen. Van De Loo, P.J., Herrmann, B. (1998) Proceedings of 7th European Conference on Non-Destructive Testing. Petroleum Institute of France. Guide for the use of Acoustic Emission on tank Floors. J.C. Lenain, A. Proust, P. Labeeuw, L. Renaud, Y.Cetre. Dיtection de la corrosion localisיe par la technique d'Emission Acoustique - CEFRACOR - 3טme Colloque Europיen Corrosion dans les Usines Chimiques et Parachimiques (1997).